Cash-A-Catch – Fresh Fish! Get your fresh fish here! Fresh Fish! Get your fresh fish here! Have you ever dreamed of being a fish monger? With Cash-A-Catch, you and up to four of your friends can experience all the excitement of selling your fishy wares on the wharf, without all the odorous aroma that usually comes when dealing in fishy products. Game play is simple: players take turns auctioning off batches of fish and seafood by presenting a steadily growing selection to their fellow players. When you’re the auctioneer, turn up a card, announce what it is (type and number of fish) and pause to give players a chance to ring the bell signaling their decision to purchase the offered batch of fish. If no one rings in, turn up the next card, announce it, pause and so on until someone rings the bell and buys your fresh catch for €10 cash. The cost is always € 10 (paid to the bank), regardless of how many fish (or cards) are in the batch. The auctioneer, however, receives € 1 commission for each card sold. Each card contains 1 to 3 fish or seafood. When only 3 players are playing, you can participate in your own auction, but you won’t receive any commission when you buy your own fish. After the auction, the buyer arranges the fish he bought among his three trays. Two of the trays are really just wooden crates, with no refrigeration, but one is an ice tray perfect for your most valuable catch. You can only store one type of fish in each tray. Any leftovers have to go in your garbage can. You really don’t want to accumulate too many fish in your garbage can because at the end of the game you have to pay the bank € 1 each for the fish you trashed. Overbuying isn’t the only way you’ll accumulate trash, though. When you’re the auctioneer, before you begin an auction, you may sell some or all of your fish to the bank. The more fish you have of a particular type, the more they’re worth. (Note the handy chart.) Whenever a player sells fish, the other players must check their wooden trays for fish of the same kind. If they have any fish of that type, they must place the highest valued one into their garbage can. Fish in your ice tray are protected from spoilage and never have to be trashed. The illustrations on the cards of Cash-A-Catch are fun and colorful and include 6 kinds of freshly caught fish and seafood: eel, shark, flounder, crawfish, tuna, lobster and octopi. Each card represents 1 to 3 fish or seafood. The octopi act as jokers or wildcards. There are also two types of action cards: Fish Thief and Canned Fish. The Fish Thief, appropriately depicted as a cat, allows you to steal the top-most fish card from another player’s tray. Canned Fish allows you to remove up to two cards from your garbage can and put them on the discard pile. This could save you as much as € 6 at game end! The two other cards in the deck, End Phase and Market Close, signal the last phase of the game and game end. Once the End Phase card appears, buyers may sell their fish right after sorting them into their trays (and garbage can), instead of having to wait until they’re the auctioneer. When the Market Close card appears, however, the game ends immediately. Players can sell any fish left in their trays, then must pay the bank for the fish in their garbage cans. Everyone counts their money and the player with the most cash for their catch wins! 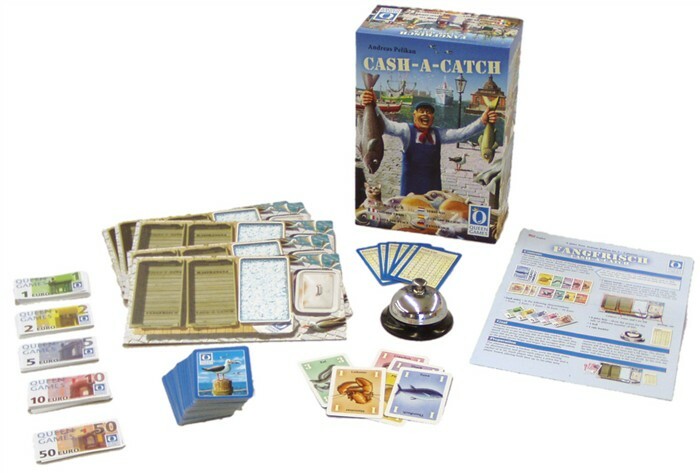 Cash-A-Catch, a Fairplay À la carte Award Winner, is an excellent family game supporting 3 to 5 players ages 8 and up. Play is quick, interesting, and constantly engaging. If you don’t pay attention to the auction, you’ll miss out on the best fish! Play time is a short 20 to 30 minutes. 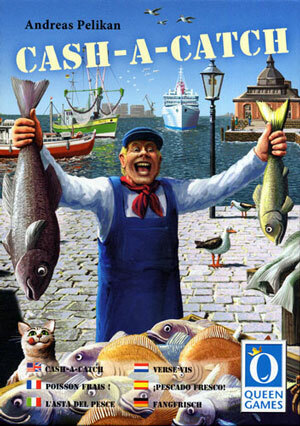 The original German title of Cash-A-Catch, Fang Frisch, translates to Fresh Catch. Fresh fish! Get your fresh fish here!